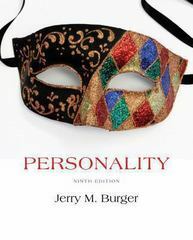 Personality 9 Edition This proven text fuses the best of theory-based and research-based instruction to give readers an illuminating introduction to personality that is accessible and understandable. The author pairs "theory, application, and assessment" chapters with chapters that describe the research programs aligned with every major theoretical approach. Biographical sketches of theorists and accounts of the stories behind influential research programs help readers gain an understanding of how classic and contemporary findings relate to each other, and reinforce the idea that theory and research perpetuate one another. In-text self-assessments encourage readers to interact with the material and allow them to learn more about their own personality.